Based on the demonstrated effectiveness of palliative care in the alleviation of symptoms and enhancement of life quality, it is important to incorporate palliative care early in the respiratory disease trajectory. Quality palliative care addresses eight domains that are all patient and family centred. Palliative care interventions in respiratory conditions include management of symptoms such as dyspnoea, cough, haemoptysis, sputum production, fatigue and respiratory secretion management, especially as the end-of-life nears. A practical checklist of activities based on the domains of palliative care can assist clinicians to integrate palliative care into their practice. Clinical management of patients receiving palliative care requires consideration of human factors and related organisational characteristics that involve cultural, educational and motivational aspects of the patient/family and clinicians. To explain the basic domains of palliative care applicable to chronic respiratory diseases. To review palliative care interventions for patients with chronic respiratory diseases. To outline a checklist for clinicians to use in practice, based on the domains of palliative care. To propose recommendations for clinical management of patients receiving palliative care for chronic respiratory diseases. According to the World Health Organization (WHO), palliative care is defined as “an approach that improves the quality of life of patients and their families facing problems associated with [serious or] life-threatening illness, through the prevention and relief of suffering by means of early identification and impeccable assessment and treatment of pain and other problems, physical, psychosocial and spiritual” . Patients facing life-threatening illness often experience unnecessary and preventable suffering including extreme and prolonged pain and other symptoms, psychological distress and experience poor communication with clinicians, resulting in enormous strain on patients and caregivers [2, 3]. Unmet needs in the physical, psychosocial and spiritual domains are common . As a result, the last few weeks and months of life may be additionally burdened with physical, emotional and spiritual suffering on the part of the patient and their loved ones. Early introduction of palliative care could improve function and quality of life (QOL) for individuals with serious, life-limiting conditions, such as patients with respiratory diseases, throughout disease trajectories and across all healthcare settings . In many areas of the world, “supportive care” is the preferred wording in describing this service rather than “palliative care”, as the connection between palliative care and hospice services was reported by patients and families to increase distress and decrease hope . 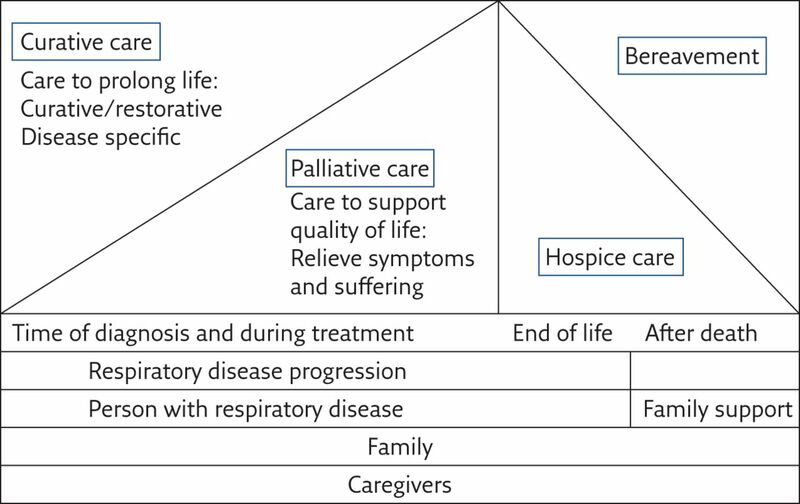 To focus this article on the goals of palliative care, we will consider “palliative care” interchangeable with “supportive care” as appropriate to health and disease care (table 1). In 2017 Meier and Morgan , in describing their work at the Center to Advance Palliative Care, suggested a more comprehensive definition of palliative care as: “…specialized medical care for people with serious illnesses… focused on providing patients with relief from the symptoms, pain, and stress of a serious illness… to improve quality of life for both the patient and the family. Palliative care is provided by a team of doctors, nurses and other specialists who work with a patient’s other doctors to provide an extra layer of support. Palliative care is appropriate at any age and at any stage in a serious illness, and can be provided together with curative treatment”. This updated definition is consistent with the WHO definition of services focused on pain and symptom management by an interdisciplinary team, including psychosocial and spiritual care consistent with patient/family needs, values, preferences, culture and beliefs. There are multiple studies that have demonstrated the benefits of palliative care in terms of reduction of patient symptoms and enhancing patient QOL, resulting in high levels of patient and family satisfaction with care, and in reducing readmissions to hospital with related cost-benefits to healthcare systems. To more effectively improve QOL, reduce depressive symptoms, support coping and help communication about end-of-life care preference, palliative care is best integrated in programmes or through consultations specific to the patient, family and disease, just as oncology care is personalised [8, 9]. Palliative care programmes, i.e. interdisciplinary care focused on relief of pain and other symptoms in support of best possible QOL for patients with serious illness and their families, or consultations with palliative care experts where such programmes are not available have both been shown to reduce symptoms, alleviate suffering, improve doctor–patient communication and satisfaction with care, improve family satisfaction, and enhance the efficiency and effectiveness of hospital services [8, 10]; they are also associated with hospital cost savings [11, 12]. Palliative care consultations for inpatients have successfully identified unrecognised symptoms and unmet problems [13, 14]; and have been associated with lower use of intensive care units (ICUs) , lower likelihood of dying in an ICU , lower costs of care  and improvement in care processes, including opioid prescribing and documenting patient goals for care [13, 16]. People often confuse palliative care and hospice care. Hospice care systems were designed to be used at the end of life. The hospice model of care, depending on the country, can limit admission to a hospice to those with a 6-month prognosis for life and in many systems requires the discontinuation of “curative” treatments . Palliative care, by contrast, is recommended for all patients with serious symptoms, with initiation at the time the patient is first diagnosed and continued throughout the disease trajectory. Multiple studies have demonstrated that transforming care for the population living with serious and life-threatening conditions requires a fundamental shift towards palliative care that is coordinated around a range of services and patient conditions. Palliative care teams have been a very effective component of inter-professional holistic care. Professional-level interactions may include advice or case conferencing, as well as support among clinicians about the case. Clinician–patient communication is significantly improved when palliative care professionals, who receive extensive training in compassion and communication, are part of the team. A palliative care consultation, usually with a palliative care physician or nurse practitioner, has also been demonstrated to improve symptom relief and enhance QOL in patients whose primary physician is of another specialty . Palliative care, with appropriate coordination and monitoring of care, can assist in reducing anxiety and can empower patients and families by supporting their wishes throughout the illness trajectory, as well as during the dying process. A Cochrane database systematic review of palliative care found reliable evidence that home palliative care meets patients desire to die at home and lessens symptom burden, especially in patients with cancer . Figure 1 adapts a model of palliative care to patients with respiratory disease. Model of palliative care for respiratory disease. Adapted from . In developing palliative care systems, training programmes are essential. Palliative medicine is a medical subspecialty in Canada, UK, Ireland, Australia, New Zealand and the USA. As of 2014, 18 out of 53 countries in Europe reported certification in palliative medicine as a specialty or subspecialty, they were (in alphabetical order): Czech Republic, Denmark, Finland, France, Georgia, Germany, Hungary, Ireland, Israel, Italy, Latvia, Malta, Norway, Poland, Portugal, Romania, Slovakia, and the UK . The trend for specialisation in this area is evident. These specialty trained providers are key to the palliative care interdisciplinary team of doctors, nurses, social workers, chaplains and other specialists. Palliative care specialist education includes how to comprehensively coordinate care with other clinicians and within the team, manage symptoms, and help patients and families to cope with their stressors. Training programmes are critical to implementing quality palliative care. The National Consensus Project for Quality Palliative Care  categorises quality palliative care within eight domains, all of which are patient and family centred. Table 2 lists brief descriptions of the eight domains. Using palliative care that provides integrated healthcare for individuals with respiratory diseases has shown great potential to improve patient care and outcomes . A palliative care model using interdisciplinary teams has demonstrated ability to improve care for patients with advanced lung disease through managing pain and other symptoms, facilitating interpersonal communication, supporting shared decision making, and coordinating care . Respiratory conditions that may benefit from palliative care include, but are not limited to: lung cancer, COPD, cystic fibrosis, and pulmonary hypertension. Palliative care in these respiratory conditions often includes symptom management and support of patients with dyspnoea, cough, haemoptysis, sputum production, fatigue, and respiratory secretion management, especially as the end-of-life nears. Helping people manage their symptoms and improving a patient’s ability to live with serious respiratory conditions are international concerns . Clinical practice guidelines are important in palliative care planning, which includes both disease-focused and palliative treatments . Comparison examples of disease-focused and palliative treatments in respiratory diseases are presented in table 3. Lung cancer is the second most commonly diagnosed cancer; and globally, lung cancer is the most common cause of death from cancer, with 1.38 million deaths recorded in 2008 (18.2% of the total of all cancer deaths according to the American Lung Association lung cancer fact sheet and the GLOBOCAN 2008 report) [23, 24]. Likewise, the financial burden of lung cancer is high. National expenditures for lung cancer were estimated at USD 13.4 billion for 2015 in the USA and EUR 18.8 billion in the European Union, making lung cancer the most costly of all cancers worldwide [25, 26]. Management of patients with lung cancer is an increasingly complex issue as patients live longer with growing symptom burdens. The majority of patients with lung cancer are still diagnosed at a late stage and receive standard, active cancer therapies including radiation, surgery and chemotherapies. Lung cancer continues to have a poor prognosis. Progressive cancer treatment may cause persistent residual side-effects and result in advanced lung cancer patients suffering from numerous symptoms, especially fatigue, appetite loss, dyspnoea, cough, pain and depression [27, 28]. High levels of symptom clusters and distress decrease their ability to manage symptoms, exacerbate disease progression and lower their hope, and as a result functional ability and health-related QOL are extremely low [29, 30]. Hope and freedom from suffering are important for coping with lung cancer; lack of hope has increased cancer symptoms and psychological distress among lung cancer patients . In addition to adverse reactions to treatment, advanced lung cancer patients undergo the burden of the natural course of the disease as well as the uncertainty of survival . These escalating symptom–reaction consequences require more healthcare services, which in turn results in negative life consequences not only for the patients but also their family/caregivers [18, 31]. Optimal management with palliative care could improve symptoms, anxiety and disease morbidity, as well as reduce costs among patients with lung cancer. The prevalence of COPD is increasing worldwide . Its incurable nature and unpredictable course, with resulting intense symptom distress and poor QOL, have led to recognition of the potential of palliative care to mitigate the challenges patients and families face . COPD, including emphysema and bronchitis, is a disease of airflow obstruction that makes breathing and activity difficult. Smoking, air pollution, genetic defects and respiratory infections are all aspects of the increase in cases of COPD worldwide. The WHO COPD fact sheet reported that 65 million people have moderate-to-severe COPD and 5% of all deaths worldwide are caused by the disease . Half of adults who have difficulty functioning physically have COPD without being diagnosed . A retrospective study of 339 British patients who died of COPD, found that 41% either left the house less than once per month or never left, and 47% were hospitalised at least twice during the final year of life; 67% died in the hospital and only 63% knew that they could die from COPD . Others have also confirmed that patients with COPD are often unaware of the progressive course of their disease and the possibility they could die from COPD . Symptom burden has been described as greater than lung cancer  with dyspnoea the most reported symptom. Disease-focused care in COPD involves multifaceted assessments to monitor the disease and symptoms, reduce risk factors of smoking and air pollution exposure, slow disease progression, cope with exacerbations, and address the psychosocial needs of patients and caregivers. Disease-focused treatment is for symptom management, improving functional abilities, and ongoing surveillance to prevent exacerbations . The proportion of hospitalised COPD patients with documented unmet palliative care needs was almost twice as great as other hospitalised patients, yet only 10% of those had physicians who recognised their need for palliative care . The issue of inadequate palliative care in COPD is one example of healthcare inequality that can be improved by addressing the barriers of prognostic uncertainty, low provider skill in palliative care discussions, fear of opioid treatment for respiratory disease symptoms, fear of losing hope, and implicit bias against patients who smoke or have smoked . Palliative care along with disease-focused evidence-based care with ongoing patient education and support are needed . Studies have documented that palliative care in COPD is more effective when offered earlier in the trajectory, rather than waiting for referrals at the end of life [40, 42]. Palliative care, incorporating advanced care planning, can improve life quality by proactive, collaborative disease treatment, with appropriate use of opioids to support care and comfort together [22, 34, 43]. CF is a frightening genetic disease affecting primarily the lungs and digestive system, due to defective proteins that result in unusually copious, sticky mucus obstructing the lungs leading to infections. Today, three-quarters of CF cases are diagnosed by the age of 2 years and a majority of those living with CF are 18 years or older. Life expectancy of children with CF was so low in the middle of the last century that most died before attending school. Remarkable progress has led to intense improvements in length and QOL for patients with CF, including options for lung transplants and gene therapies, such that those born in the 21st century are expected to live into middle-age . As a result this chronic, progressive disease presents complex and ongoing challenges in management, and research suggests that palliative care consultation early in the process could be an important component of treatment . Children and adults with CF today have more therapy options than they have ever had before: medications to clear the mucus from airways and reduce inflammation; aerosolised antibiotics; and, recently, breakthrough genetic therapy to address the underlying cause of CF. Palliative care helps patients with CF to cope with symptoms and treatments, psychologically adjust to the trajectory of the disease, consider the impact of lung transplantation, and plan for the end of life. Karlekar et al. found that, although few patients with CF had completed an advanced directive, 90% were willing to have the discussion and desired their clinicians help in decision-making. A palliative care consultation could have met their needs by integrating team-based care and decision support to assist in improving coping skills, pain management, treatment adherence, and advanced care planning into their disease-focused care . The WHO divides pulmonary hypertension (PH) into five groups based on the cause of the condition. In all groups, the average pressure in the pulmonary arteries is higher than 25 mmHg at rest or 30 mmHg during physical activity. Due to the nonspecific nature of symptoms, PH is most frequently diagnosed when patients are in the advanced stages of the disease . Currently, there is no cure for PH and treatment is solely aimed at improving symptoms and exercise tolerance, long-term outcomes and QOL, as well as slowing the rate of deterioration . Pulmonary arterial hypertension (PAH) is a rare (estimated prevalence of 15–50 cases per million) subset group of PH, characterised by progressive pulmonary vascular resistance, leading to right heart failure and death. Disease management in PAH is complex involving a range of treatment options including prevention and prompt treatment of chest infections, as well as supportive oxygen therapy and medication . As such, palliative care assessment supporting lifestyle changes, medicine to relieve treatment side-effects and suffering should be considered. Palliative care can be concomitant with PH and PAH therapies to treat symptoms. PAH diagnosis is progressive and non-curable, and therapies and symptoms are life-limiting . When current PH/PAH therapy includes undesirable side-effects palliative care referral should be implemented if it has not yet been done. Palliative care is an option to consider when PH/PAH patients present with challenging psychological, social or spiritual symptom management issues, when the patient is experiencing decreased function, or it is not possible to provide more intense therapy . If emergency department visits/admissions within 12 months increase with the worsening symptoms, palliative care could support family coping/advanced care planning and link the patient and family to additional resources such as pastoral counselling or social workers. Nine out of 10 patients and families are willing to discuss advanced directives . Research by Provencher and Granton  studying patients with PAH documented that a “supervised rehabilitation program, psychosocial support, and referral to palliative care [can] lead to improvements in exercise capacity and quality of life”. The use of palliative care in advanced respiratory diseases such as lung cancer, COPD, CF and pulmonary hypertension is complex and has been offered in multiple ways including palliative care consultations, direct palliative care team management and specialised centres for palliative care . The desired outcomes of palliative interventions are to enable early detection of disease exacerbations, provide timely intervention for early symptom management, decrease patient and family/caregiver anxiety, reduce unscheduled visits to the emergency room, prevent hospitalisations, and support advanced care planning to avoid suffering, especially at the end of life. Common symptoms in respiratory diseases are dyspnoea, cachexia, fatigue, haemoptysis, cough (with and without sputum), physical pain, and psychosocial discomfort. A brief description of actions for symptom management is provided here; however, an in-depth discussion of the management of these symptoms is beyond the scope of this article and the reader is referred to the ERS Monograph on Palliative Care in Respiratory Disease . Dyspnoea has many causes and management focuses on the cause; relief of obstructions or pleural effusions may be helpful in addition to medications, supplemental oxygen or other indicated treatments. Assessment and management of dyspnoea should include a plan for “dyspnoea crisis”, i.e. the “sustained and severe resting breathing discomfort that occurs in patients with advanced, often life-threatening illness and overwhelms the patient and caregivers’ ability to achieve symptom relief” . The word COMFORT can be used to plan for a dyspnoea crisis with these customisable steps: Call for help; Observe and assess for causes; Medicate as per clinician’s plan (e.g. opioid use); Fan to face may help; Oxygen as prescribed; Reassure and help relax; and Timing record of what works and when to use in future. Cachexia including symptoms of appetite loss, nausea and changes in taste can be debilitating. Approaches can include a nutrition consultation, medications to stimulate appetite, and anti-emetics . Early intervention is important to maintain good QOL for patients with lung cancer. Cancer-related fatigue has been reported in four out of five patients with lung cancer . Assessment for ongoing fatigue, especially following disease-focused treatments, is essential as it can have a strong negative impact on QOL. Treatments incorporate improving psychosocial experiences, increasing physical activity for short periods, sleep hygiene, and medications such as modafinil or antidepressants. Haemoptysis is more common in lung cancer than in other respiratory diseases and is always a distressing symptom of the disease and its treatment, increasing anxiety in the patient and caregivers. Symptom management might involve positioning the patient with the affected lung dependent to decrease blood flow, medications such as anticoagulants or antifibrinolytics may be useful, or interventions such as coagulation therapies . Palliative care often includes reassurance, and discussion of prognosis to share decision making about ongoing care/treatments. Palliative management of the environment to be less frightening might include dressing the patient in dark clothing and using dark sheets and towels to avoid the red on white appearance of bleeding. Cough, with or without production of sputum, is a bothersome symptom of many respiratory diseases. It is the body’s attempt to clear the airways and when it becomes chronic and intractable, it is debilitating, both physically and psychologically . Common antitussives may offer some relief; however, determining the cause offers the best chance to relieve this symptom. Removing irritants such as smoke or other environmental pollutants is important. If an angiotensin-converting enzyme inhibitor is the cause and can be stopped, improvement is often seen in a month. Asthma or COPD may be comorbidities and may be helped by bronchodilators such as β2-agonists. Allergic causes of cough may respond to nasal sprays and decongestants like pseudoephedrine, and inhaled corticosteroids or antibiotics may be needed. Systemic opioids can be effectively used for cough control, especially for intractable cough. Control of purulent sputum with cough may require antibiotics. Addressing physical pain management, which is frequently a symptom of lung cancer, includes individualised medications such as nonsteroidal anti-inflammatory drugs, opioids and bisphosphonates if there is bone involvement. Effective pain management with opioids entails attaining adequate analgesia without undue adverse side-effects. According to adapted WHO guidelines [57, 58] and the European Association for Palliative Care (EAPC) guidelines , morphine is the step 3 opioid of choice to achieve effective pain control in most patients. In a few patients pain relief without extreme adverse effects may need alternative opioids, spinal administration of analgesics or non-drug methods of pain control such as nerve blocks. Pain is not just a physical symptom, but includes social, psychological and spiritual dimensions, and assessment is best if the patient can actively be involved in assessing each dimension . Psychosocial discomfort is usually greatest immediately following diagnosis, at times of exacerbation and at the end of life. Clinicians should plan for active surveillance for manifestations of depression in both patients and caregivers. Advanced care planning is a key component of palliative care and can be helpful in identifying patient and family emotional needs and values . Clinician/patient/caregiver communication must be clear and facilitate the understanding of options for treatment or non-treatment as well as enhanced family well-being. Coordination of services can also contribute to decreasing anxiety for patients and caregivers. Addressing spiritual feelings, requests and needs can help address uncertainty and spiritual distress. Professionals trained and skilled in addressing these needs should be in the palliative care team. What are the main reasons to include palliative care for patients with respiratory disease? Because of the concomitant physical and psychosocial challenges of respiratory diseases, single disease-oriented clinical guidelines are not adequate for management of care where patients have significant symptom burdens, psychosocial problems including anxiety and depression, low QOL and distressing suffering at death . There is a need for patient-centred care to achieve optimal management in terms of the disease and its impact on patients and their families/caregivers, especially towards the end of life. Caregivers appreciated palliative care use and contact with the palliative care team in supporting patients at home and patients were satisfied that palliative care helps them feel supported after hospital discharge giving them confidence, so care is ongoing and symptom-management can be improved. Early introduction of palliative care decreased suffering and provided a communication conduit among clinicians, patients and their families/caregivers. Difficulty in communication has been one of the greatest concerns for families/caregivers with a desire to know accurate information about the patient’s condition and what to expect. The literature reports no respondents stating that they received too much information about the patient’s condition [18, 31]. Palliative care team members were seen as patient advocates and good communicators. The assistance of palliative care clinicians in helping patients to be involved in symptom management and relief of suffering was highly valued. Palliative care supported discussions/conversations that truly addressed patient/family preferences in a caring and supportive manner, while providing an opportunity for perhaps difficult end-of-life planning. With training and team support, tensions between remaining hopeful and presenting realities in terms of a patient’s condition can be better addressed . Early use of palliative care services had benefit in terms of improving care for patients with respiratory diseases, and supported cost savings in moving away from ineffective curative and restorative care to enhanced quality of living for patients and their families. Evidence of benefits is needed to develop systems and policy changes. Lanken et al. have prepared a seminal policy statement that addresses multiple components of palliative care for patients with respiratory diseases. Reinke and Meier  have identified research needed to support policies promoting access to palliative care as well as provide evidence of quality and safety that can support reimbursement to healthcare systems. What are the limitations and challenges of palliative care in management of patients with respiratory disease? It is never too early for clinicians to introduce a discussion of palliative care with patients and their families . Ongoing evaluation of symptoms, responses to symptom management, knowledge of the disease and the patient’s perception of their QOL and health status are all components of the assessment needed for quality palliative care. Multiple tools are available and that in itself is a challenge – identifying what to assess, when and how will need ongoing dialogue. Specialised palliative care services have demonstrated impact on patients QOL, especially in advanced care planning for disease progression and end of life. However, adding another team to an already complex, often fragmented system can be ineffective. It is critical to keep the patient and family at the centre of care, with palliative care integrated across the disease trajectory from diagnosis to death . Care planning is challenged to include patient and family preferences, in-depth communication, responsiveness to needs in a timely manner, and proactive collaboration with ongoing assessment and monitoring of service use to enhance patient self-management and confidence and decrease suffering. Referral to palliative services requires prudent use of resources to be accessible. It is never too “early” to introduce palliative care for patients with respiratory diseases. Nevertheless, detailed attention to planning is needed for introducing palliative care into varied settings. A recent study implementing palliative care into a real-world community practice identified the need to adapt palliative care support to the existing work settings . To support sustainability, assessment tools, planning forms and educational programmes need to be tested in the actual practice settings to decrease patient and caregiver burden and truly integrate the palliative care team into the system of care. Implementation was facilitated by communication of administrative support, and preparation to increase readiness and adaptability within the setting before introducing integrated palliative care. Barriers to implementation comprised rapidly changing disease-focused care and an unrecognised need for palliative care support by patients and providers, as well as staffing limitations, and processes dependent on staff who were not cross-trained. A checklist for quality palliative care (table 4) may help clinicians incorporate a revised approach to practice. Beginning patient-centred discussions to set goals for care should progress to advanced care planning and transition to end-of-life conversations. Regulatory issues must be considered and designed into palliative care protocols. As palliative care programmes are planned and implemented, there will be a constant need to re-evaluate and investigate new options. Finally, implementing a palliative care service requires consideration of human factors and related organisational characteristics that involve cultural, educational and motivational aspects of the patient/family and clinicians who are at different levels of the healthcare systems. Based on the demonstrated effectiveness of palliative care in the alleviation of symptoms and enhancement of QOL, there is a strong movement to incorporate palliative care into the treatment of patients with a wide range of illnesses, and in various healthcare settings early in the disease trajectory (e.g. ICU, nursing homes). The American Society for Clinical Oncology and the EAPC are dedicated to the promotion and development of palliative care throughout the USA and Europe. They lead the way in publishing recommendations and guidelines indicating that treatment of all cancer patients with symptoms or advanced disease should include palliative care throughout the illness trajectory. They influence, encourage and advocate the need for high quality palliative care throughout the life span by developing and sharing palliative care research, policy, education and evidence-based practice. Using palliative care, patient satisfaction is high, while provider satisfaction is often ambiguous based primarily on a fear of eliminating the patient’s feeling of hope. Nevertheless, the application of palliative care in practice has been effective, especially when introduced into systems that lacked a clear programme for delivery of patient-focused holistic care in a team-based model. Ferrell et al. have designed a palliative care intervention to support patients in phase 1 clinical trials, with a detailed list of components for understanding the disease, symptom management, decision making and referral components for a quality palliative care programme. Considering the value of improved QOL and a peaceful death, improving access to palliative care for patients with respiratory diseases will benefit patients, clinicians and society. As detailed descriptions of palliative care in respiratory disease are beyond the scope of one article; the reader is referred to the ERS Monograph on Palliative Care in Respiratory Disease  and the accompanying articles on aspects of palliative care in this issue of Breathe for further information. 2) Is the following statement true or false? Many patients living at home could benefit from palliative care; it is never too early to include the palliative care discussion as part of a patient visit at the time of or following diagnosis.
. WHO Definition of Palliative Care. www.who.int/cancer/palliative/definition/en/ Date last updated: 2017. Date last accessed: August 21, 2017.
. The National Palliative Care Research Center and the Center to Advance Palliative Care: a partnership to improve care for persons with serious illness and their families. J Pediatr Hematol Oncol 2011; 33: Suppl. 2, S126–S131. , et al. Palliative care needs of patients with cancer living in the community. J Oncol Pract 2011; 7: 382–388.
. A model of palliative care: the palliative medicine program of the Cleveland Clinic Foundation. A World Health Organization demonstrations project. Support Care Cancer 2000; 8: 268–277. , et al. Acceptability of early integration of palliative care in patients with incurable lung cancer. J Palliat Med 2014; 17: 553–558. , et al. Supportive versus palliative care: what’s in a name? A survey of medical oncologists and midlevel providers at a comprehensive cancer center. Cancer 2009; 115: 2013–2021.
. Reframing palliative care: messages matter. Center to Advance Palliative Care (CAPC). https://media.capc.org/filer_public/14/8e/148ed435-8d5c-408c-97ca-bfd0b7dfee9c/reframing_palliative_care_slides.pdf Date last updated: April 12, 2017.
, et al. Effects of a palliative care intervention on clinical outcomes in patients with advanced cancer: the Project ENABLE II randomized controlled trial. JAMA 2009; 302: 741–749. , et al. Effects of early integrated palliative care in patients with lung and GI cancer: a randomized clinical trial. J Clin Oncol 2017; 35: 834–841. , et al. Impact on caregiver burden of a patient-focused palliative care intervention for patients with advanced cancer. Palliat Support Care 2010; 8: 395–404. , et al. Palliative care consultation teams cut hospital costs for Medicaid beneficiaries. Health Aff (Millwood) 2011; 30: 454–463. , et al. Hospital-based palliative care consultation: effects on hospital cost. J Palliat Med 2010; 13: 973–979. , et al. Improving processes of hospital care during the last hours of life. Arch Intern Med 2005; 165: 1722–1727. , et al. Palliative care consultation in the Netherlands: a nationwide evaluation study. J Pain Symptom Manage 2004; 27: 53–60. , et al. Proactive palliative care in the medical intensive care unit: effects on length of stay for selected high-risk patients. Crit Care Med 2007; 35: 1530–1535. , et al. A high-volume specialist palliative care unit and team may reduce in-hospital end-of-life care costs. J Palliat Med 2003; 6: 699–705.
. Palliative care of chronic progressive lung disease. Clin Med 2014; 14: 79–82. , et al. Effectiveness and cost-effectiveness of home palliative care services for adults with advanced illness and their caregivers. Cochrane Database Syst Rev 2013; 6: CD007760.
. Comparative analysis of specialization in palliative medicine processes within the World Health Organization European region. J Pain Symptom Manage 2015; 49: 861–870.
. Clinical practice guidelines for quality palliative care. 3rd Edn. Pittsburgh, National Consensus Project for Quality Palliative Care, 2013.
. Research priorities in subspecialty palliative care: policy initiatives. J Palliat Med 2017; 20: 813–820.
. Role of palliative care in improving the quality of life in elderly with advanced lung disease. Curr Geriatr Reports 2016; 5: 103–109.
. Lung cancer fact sheet. www.lung.org/lung-health-and-diseases/lung-disease-lookup/lung-cancer/resource-library/lung-cancer-fact-sheet.html Date last updated: November 03 2016. Date last accessed: August 21, 2017.
, eds. GLOBOCAN 2012: estimated cancer incidence, mortality and prevalence worldwide in 2012 v 1.0. IARC Cancer Base No. 11. Lyon, International Agency for Research on Cancer. globocan.iarc.fr/Default.aspx Date last accessed: August 21, 2017.
. Lung cancer in the EU. www.bms.com/content/dam/bms/us/english-social-share/Lung-Cancer-Global-EU-FINAL.pdf?linkId=15700872 Date last updated: 2015. Date last accessed: August 16, 2017.
. Increasing stringency in symptom cluster research: a methodological exploration of symptom clusters in patients with inoperable lung cancer. Oncol Nurs Forum 2009; 36: E282–E292. , et al. The symptom burden of non-small cell lung cancer in the USA: a real-world cross-sectional study. Support Care Cancer 2014; 22: 181–187. , et al. Hope in the context of lung cancer: relationships of hope to symptoms and psychological distress. J Pain Symptom Manage 2010; 40: 174–182. , et al. Uncertainty and psychological adjustment in patients with lung cancer. Psychooncology 2013; 22: 1396–1401.
. Caregiving burden, stress, and health effects among family caregivers of adult cancer patients. JAMA 2012; 307: 398–403.
. Chronic obstructive pulmonary disease (COPD) fact sheet. www.who.int/mediacentre/factsheets/fs315/en/ Date last updated: November 2016. Date last accessed: August 19, 2017.
. Palliative care in chronic obstructive pulmonary disease. J Crit Care 2016; 35: 150–154.
. Integrating supportive, palliative, and end of life care for COPD. In: Panos RJ, Eschenbacher W, eds. A COPD Primer. Warsaw/Berlin, De Gruyter Open, 2015; pp. 369–388. , et al. A randomised controlled trial on the efficacy of advance care planning on the quality of end-of-life care and communication in patients with COPD: the research protocol. BMJ Open 2014; 4: e004465. , American College of Physicians High Value Care Task Force. Communication about serious illness care goals: a review and synthesis of best practices. JAMA Intern Med 2014; 174: 1994–2003.
. Improving palliative care for patients with COPD. Eur Respir J 2015; 46: 596–598. , et al. A patient-centred model of care incorporating a palliative approach: a framework to meet the needs of people with advanced COPD? Progr Palliat Care 2013; 21: 286–294. , et al. Palliative care needs in COPD patients with or without cancer: an epidemiological study. Eur Respir J 2015; 46: 663–670.
. Inadequate palliative care in chronic lung disease. An issue of health care inequality. Ann Am Thorac Soc 2016; 13: 311–316. , et al. Palliative care and prognosis in COPD: a systematic review with a validation cohort. Int J Chron Obstruct Pulmon Dis 2017; 12: 1721–1729.
. Burden of transitions after invasive mechanical ventilation for U.S. individuals with severe chronic obstructive pulmonary disease: opportunity to prepare for preference-congruent end-of-life care? J Am Geriatr Soc 2014; 64: 434–435. , et al. The provision of generalist and specialist palliative care for patients with non-malignant respiratory disease in the North and Republic of Ireland: a qualitative study. BMC Palliat Care 2017; 17: 6.
. Palliative care for patients with cystic fibrosis #265. J Palliat Med 2013; 16: 446–447. , et al. The CF-CARES primary palliative care model: a CF-specific structured assessment of symptoms, distress, and coping. J Cyst Fibros 2017; 16: Suppl. 1, S22. , et al. Integration of palliative care into the routine care of cystic fibrosis patients. Palliat Med 2015; 29: 282–283.
. Pulmonary hypertension and palliative care: what, when, where, and why? Adv Pulm Hypertens 2016; 15: 26–31.
. Managing the patient with pulmonary hypertension: specialty care centers, coordinated care, and patient support. Cardiol Clin 2016; 34: 489–500.
. Emerging therapies and future directions in pulmonary arterial hypertension. Can J Cardiol 2015; 31: 489–501.
. Palliative care in pulmonary arterial hypertension. Curr Opin Support Palliat Care 2017; 11: 7–11.
. Current treatment approaches to pulmonary arterial hypertension. Can J Cardiol 2015; 31: 460–477.
. Palliative care in thoracic oncology. Breathe 2012; 9: 124–131. , eds. Palliative Care in Respiratory Disease (ERS Monograph). Sheffield, European Respiratory Society, 2016.
, et al. An official American Thoracic Society workshop report: assessment and palliative management of dyspnea crisis. Ann Am Thorac Soc 2013; 10: S98–S106.
. Cancer-related fatigue: the approach and treatment. J Gen Intern Med 2009; 24: Suppl. 2, 412S–416S.
. Palliative care: overview of cough, stridor, and hemoptysis. www.uptodate.com/contents/palliative-care-overview-of-cough-stridor-and-hemoptysis Date last updated: August 19, 2017.
, et al. Proposed 5-step World Health Organization analgesic and side effect ladder. Eur J Pain Suppl 2007; 1: 23–30. , et al. Implementing WHO recommendations for palliative care into routine lung cancer therapy: a feasibility project. J Palliat Med 2010; 13: 727–732. , et al. Use of opioid analgesics in the treatment of cancer pain: evidence-based recommendations from the EAPC. Lancet Oncol 2012; 13: e58–e68. , et al. An official American Thoracic Society clinical policy statement: palliative care for patients with respiratory diseases and critical illnesses. Am J Respir Crit Care Med 2008; 177: 912–927. , et al. Palliative and end-of-life care conversations in COPD: a systematic literature review. ERJ Open Res 2017; 3: 00068-2016.
. Palliative care in advanced lung disease: the challenge of integrating palliation into everyday care. Chest 2015; 148: 801–809. , et al. Integration of a palliative care intervention into community practice for lung cancer: a study protocol and lessons learned with implementation. J Palliat Med 2017; in press [https://doi.org/10.1089/jpm.2017.0143]. , et al. Palliative care and phase 1 trials: intervention to improve quality of life and provide education. Clin J Oncol Nurs 2017; 21: 473–479. , et al. Palliative cancer care a decade later: accomplishments, the need, next steps – from the American Society of Clinical Oncology. J Clin Oncol 2009; 27: 3052–3058.